WHEN: no later than 5PM on Friday, January 25, 2019. Winners will be notified on or after February 20, 2019. Application information has been sent to all Morris County high school guidance offices for distribution. Applications are available through high school guidance offices as well as online at the Morris Arts website. For more information, please call Morris Arts at (973) 285-5115, ext. 10. Given the storm conditions of the past week along with the Martin Luther King holiday, Morris Arts has extended the deadline for its 2019 Coladarci and Ehlers Arts Scholarship application. 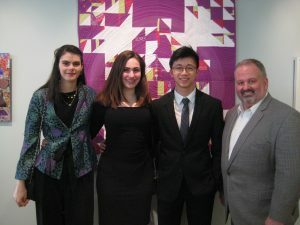 Each year, Morris Arts offers these two scholarship opportunities for graduating high school seniors who have exhibited artistic excellence in dance, drama, music, or visual arts and plan to pursue post-secondary studies at an accredited institution or acknowledged arts school or fine arts program. The Elaine Ehlers Arts Scholarship, in the amount of $5,000, and The Eugenie Coladarci Arts Scholarship, in the amount of $1,500, were created to recognize artistic excellence, encourage the artists of the future, and to celebrate the value of the arts to the human experience. Morris County high school seniors graduating in June 2019 who are currently attending public, private, or parochial school in New Jersey are eligible. Applicants must (a) be Morris County residents, (b) plan to pursue post-secondary studies at an accredited institution or acknowledged arts school or fine arts program, and (c) have demonstrated artistic excellence in any one of four (4) arts disciplines: dance, drama, music, or visual arts. The Elaine Ehlers Arts Scholarship was established in 2002 in memory of Elaine Ehlers (1953-2001), a health-care administrator by profession, who had a voracious appetite for all things artistic and musical. She derived intellectual and emotional sustenance from the arts and supported programs at many museums and musical institutions. By establishing this scholarship, an enduring legacy has been created to reward those who possess artistic talent and who plan to further their arts education. Former Ehlers winners include pianist Daniel Shleyenkov; pianist and flutist Joshua Min; harpist, Ashley Jackson; singer/composer/lyricist/pianist, arranger/community musical organizer Deborah Neigher; jazz guitarist Alex Wintz; singer/composer Tom Barth; visual artist Marissa Rich; pianist Yuqing Meng; ballroom/Latin dancer Daniel Knapp; ballet-modern dancer/ choreographer Madelyn Eltringham; trumpeter Joseph Soriano; actor Rachel Moss, percussionist Neal McNulty, percussionist Reed Puleo, composer Zachary Catron, oboist Ethan Whang and most recently, pianist John Nguyen. The Eugenie Coladarci Arts Scholarship was first awarded in 1999 in memory of Eugenie R. Coladarci, who was Vice President of Marketing and Public Relations at Chase Manhattan Bank and an active member of Morris Arts for eleven years. She was completing her first term as Board Chair when she passed away in 1997. As a statewide champion of the arts, Gene encouraged the development of young artists and believed in the value of the arts to the quality of life. The idea of a scholarship to assist talented young people wishing to continue their study in the arts was very important to her. Past winners include violinist Rebecca Racusin; visual artist Robert Douglas Fritz III; dancer Lauren Muraski; actor Ethan Saks; operatic soprano Chelsea Friedlander; visual artist Emily Trenk; visual artist Kaitlyn DeBiasse; dancer Edward Teddy” Tedholm; soprano Alessandra Altieri; visual artist Catalina Ouyang; industrial designer Miriam Buchwald, industrial designer Daniel Hounsell, soprano Katherine Merwin, ballet dancer Tori Hey, visual artist Tyler Harker, soprano Lila Dunn and most recently, actress Nicole Giordano. Applicants will be judged by a committee consisting of panelists representing each artistic discipline. All panelists are professionals with a high level of expertise in university arts education and/or professional experience in the arts. Selection will be based on artistic excellence as demonstrated by the quality of the work samples and on the basis of application materials submitted to the panel. Morris Arts, located in Morristown, NJ, is a not-for-profit organization founded in 1973 dedicated to building community through the arts. Using the arts to inspire, connect and engage, Morris Arts serves as a resource for Morris County with a special focus on arts programming in the schools and in the community, creative placemaking, arts advocacy, and support of the Morris Area community of artists and arts organizations.